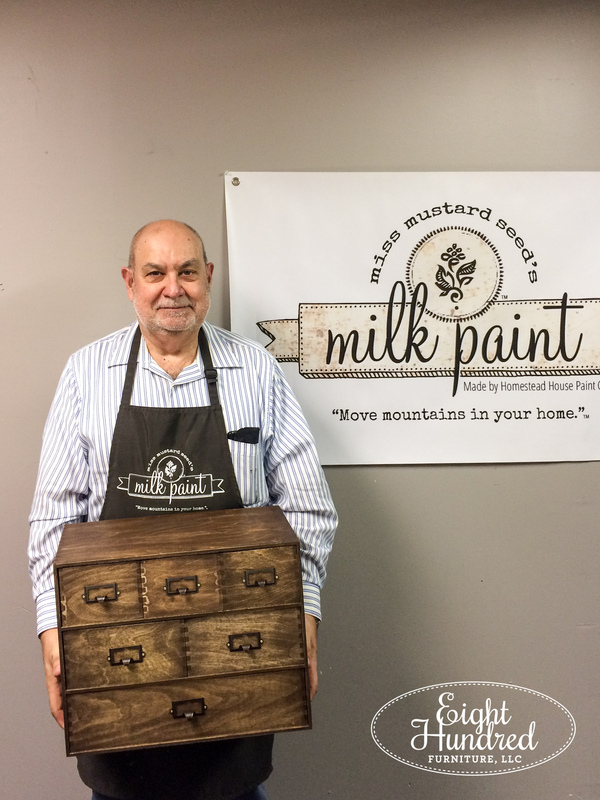 This past weekend, I hosted a Miss Mustard Seed’s Milk Paint Workshop at Morgantown Market. 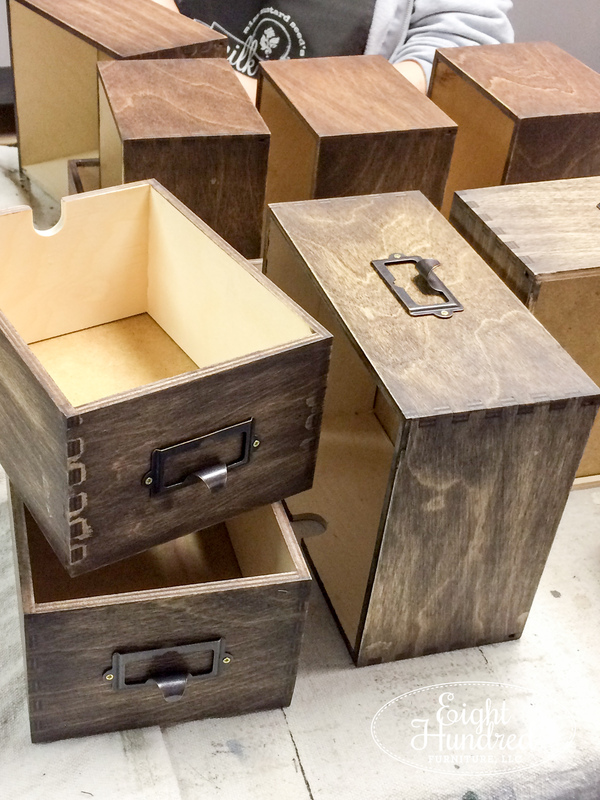 Five participants signed up and we had a blast turning these into gorgeous card catalogs. The group was such a hard working bunch. 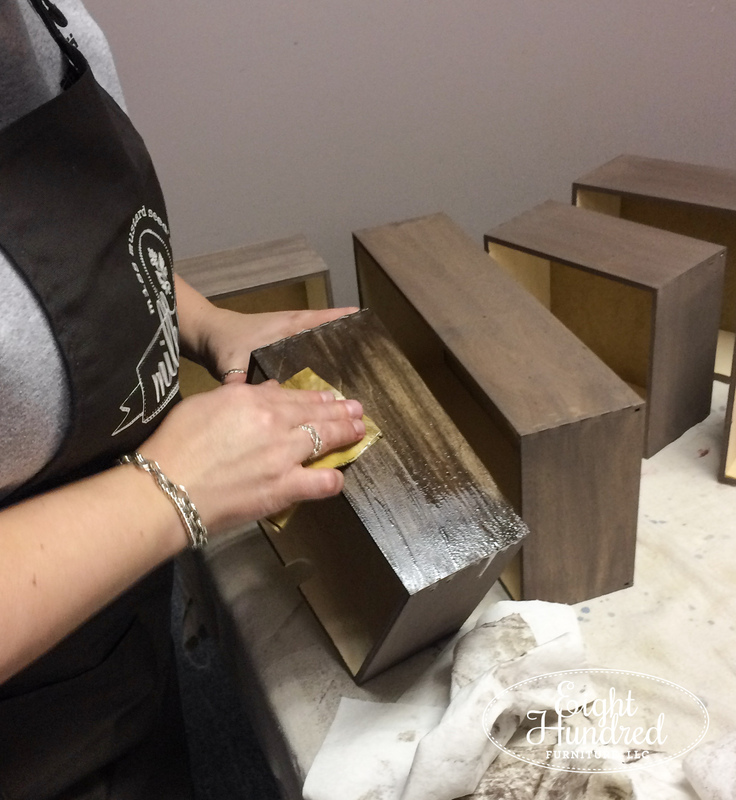 They got to work right away, mixing up Curio brown MMS Milk Paint to the consistency of a stain. 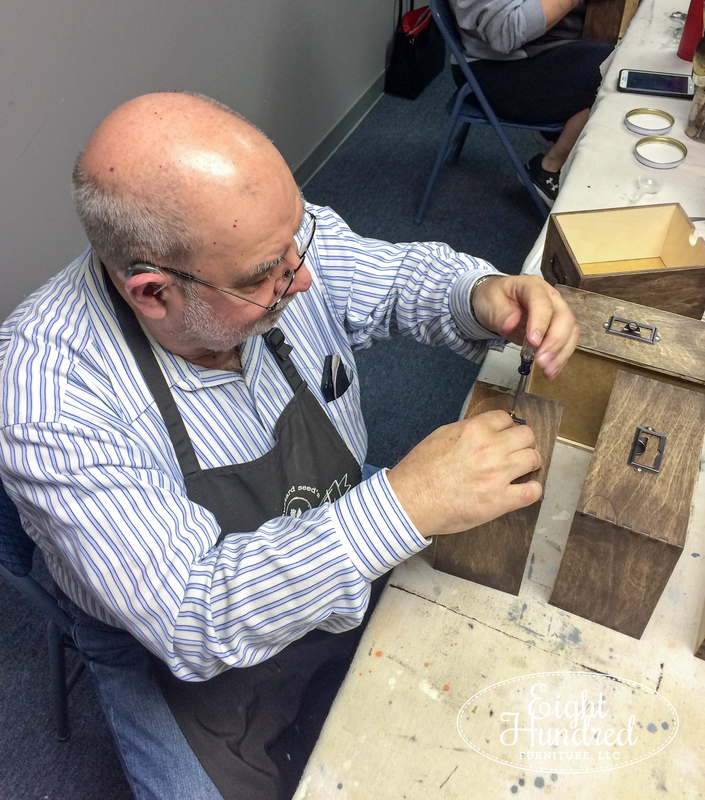 They began brushing the Curio brown on the raw wood and wiping it back to their desired opacity. 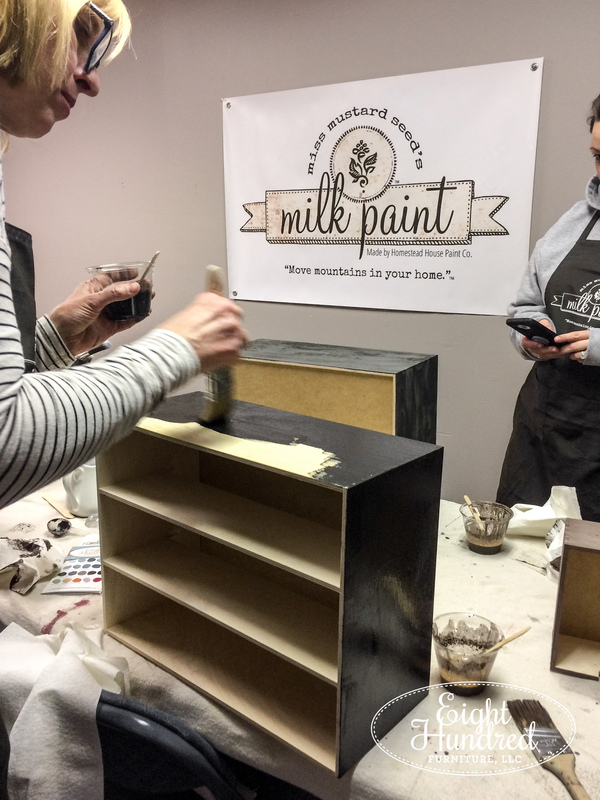 MMS Milk Paint brushes on so easily over raw wood and it’s a dream to work with! 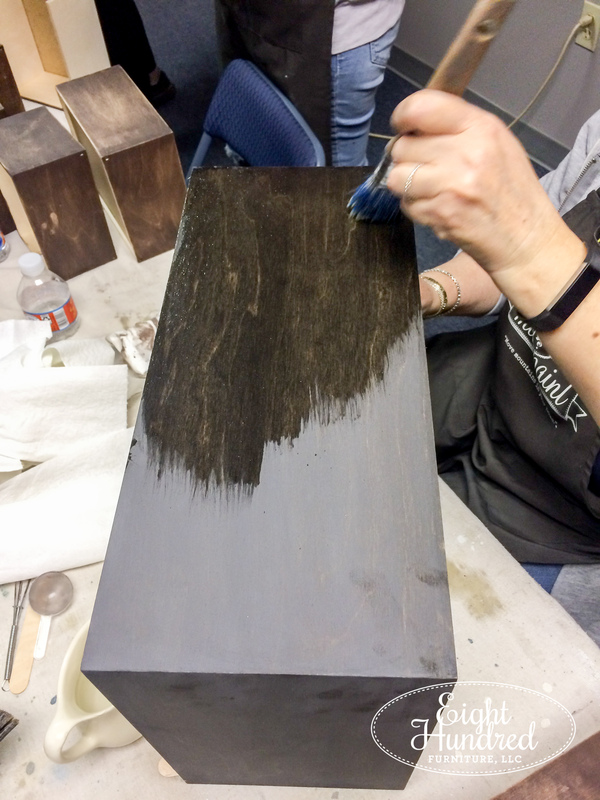 Some participants wanted a deep and rich look while others wanted it on the lighter side. 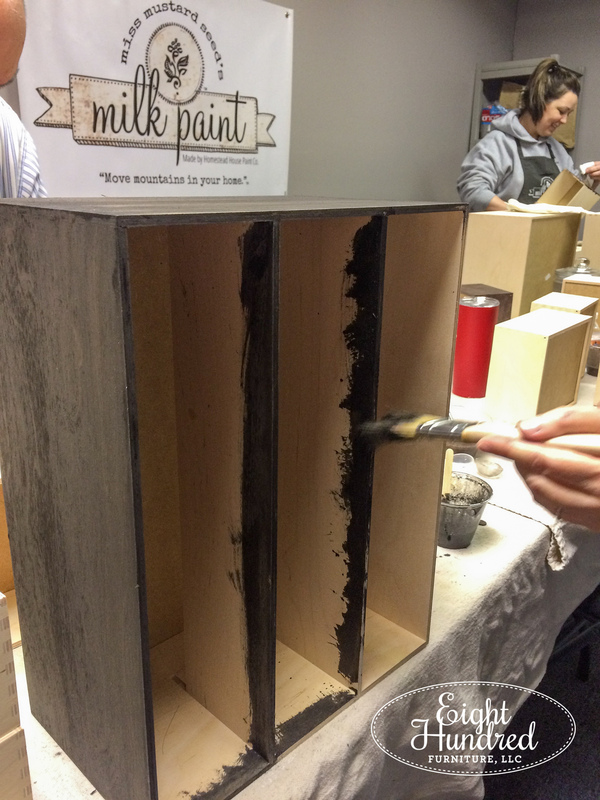 That’s what’s so nice about using MMS Milk Paint as a wood stain. You can control how deep the color is by mixing and wiping. 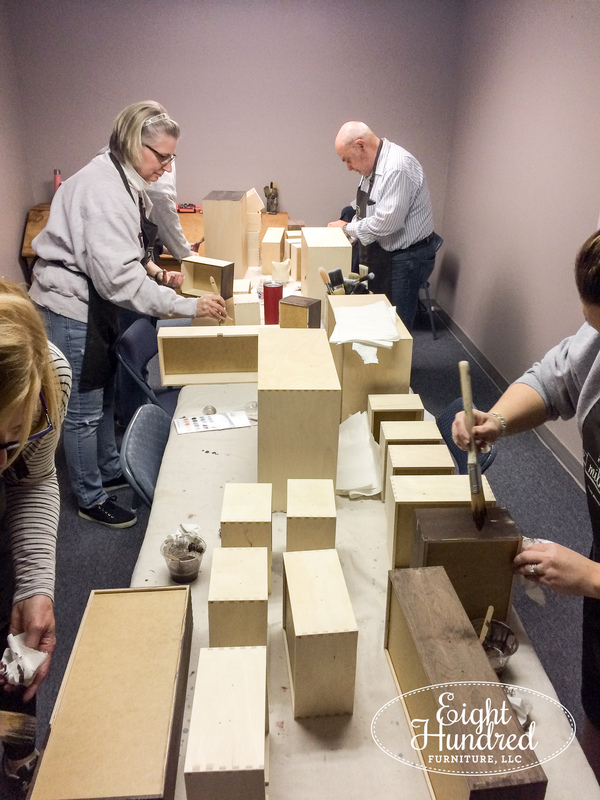 The participants painted the outsides of their boxes and the body of their storage piece. 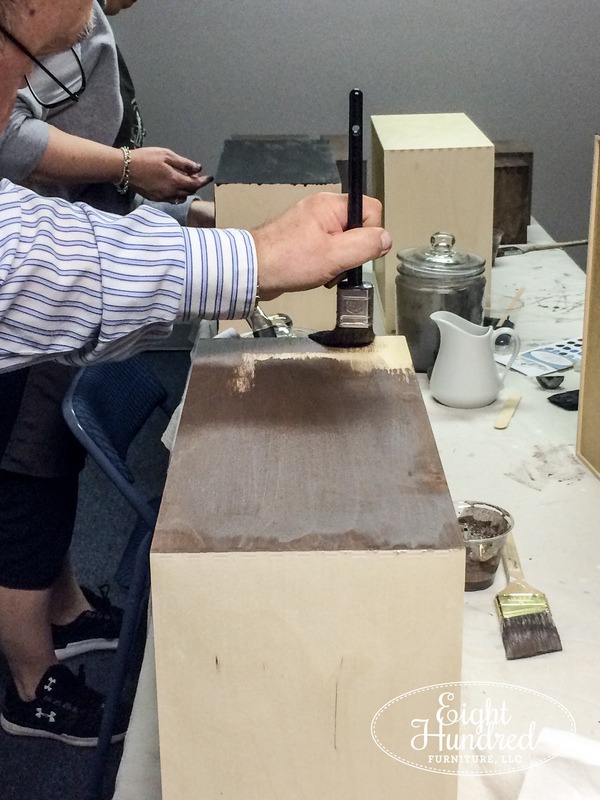 They took the paint inside the ledges to ensure that no bare wood would be peeking out. 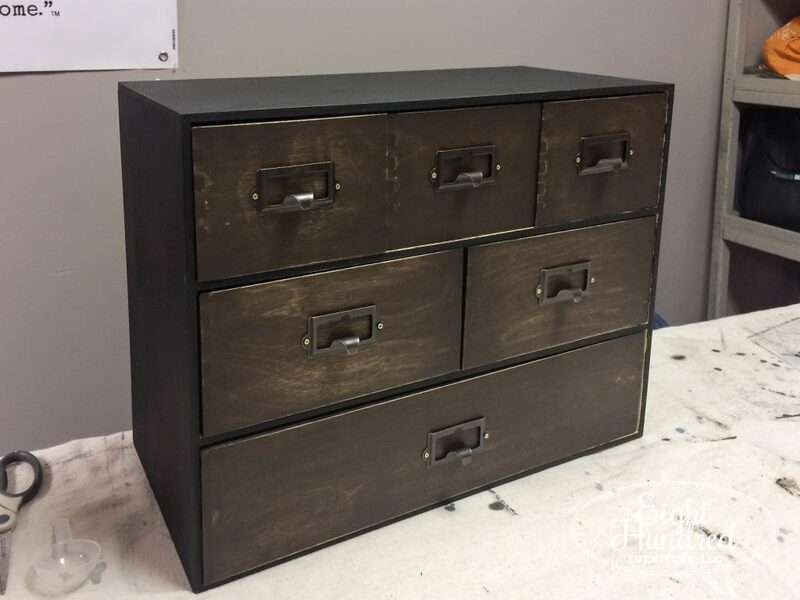 Some folks wanted to paint the main box in Typewriter black and the drawers in Curio brown for a lovely combination. I didn’t even think about that option, but their creative juices were flowing and there was no stopping them! 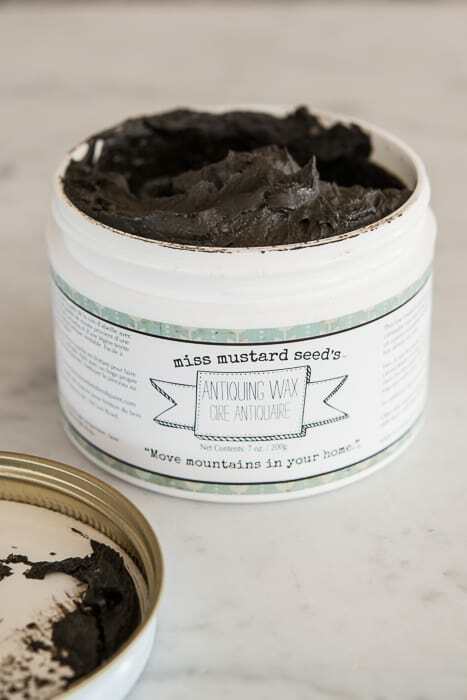 Once everything was dry, it was time to seal them with Hemp Oil. 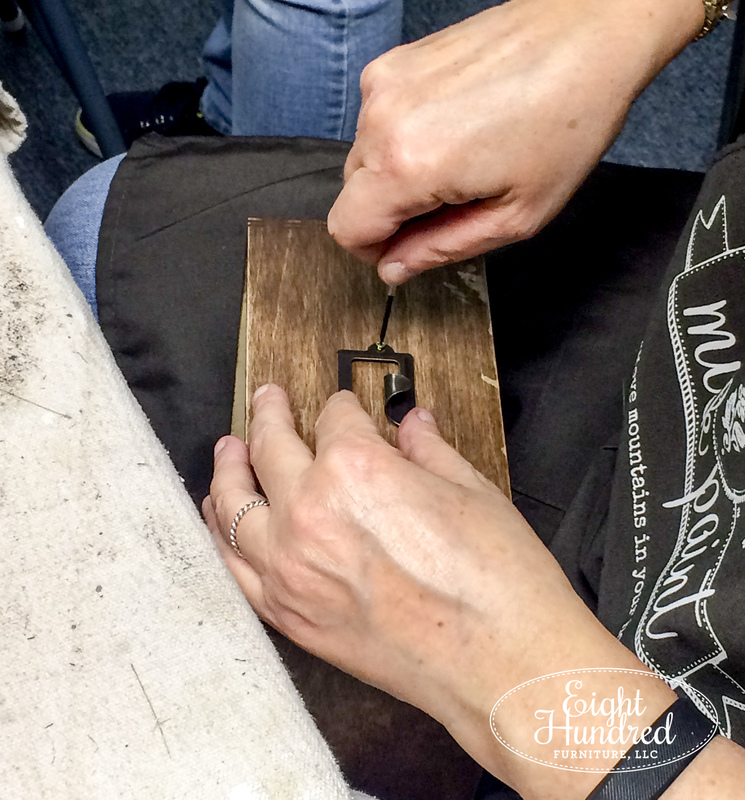 The pieces immediately brightened up and came alive once the Hemp Oil was applied. 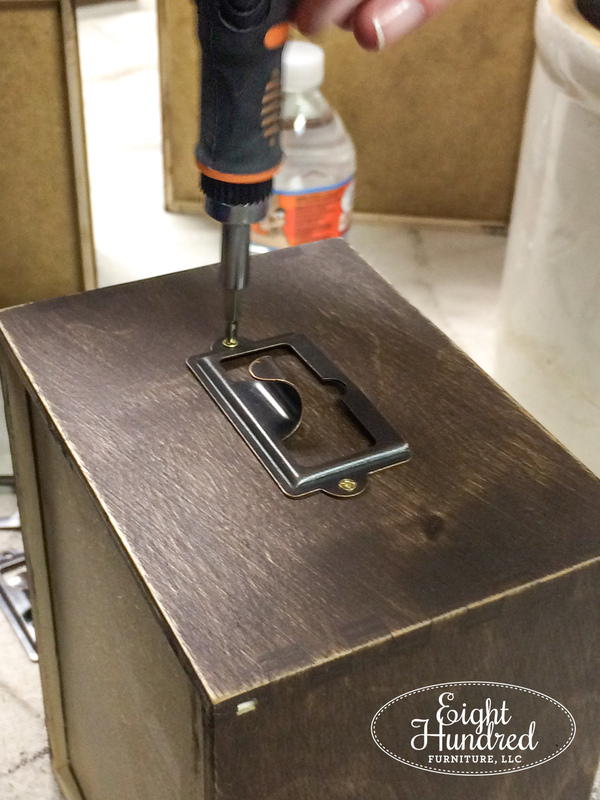 This is probably my absolute favorite part of using this particular finish! 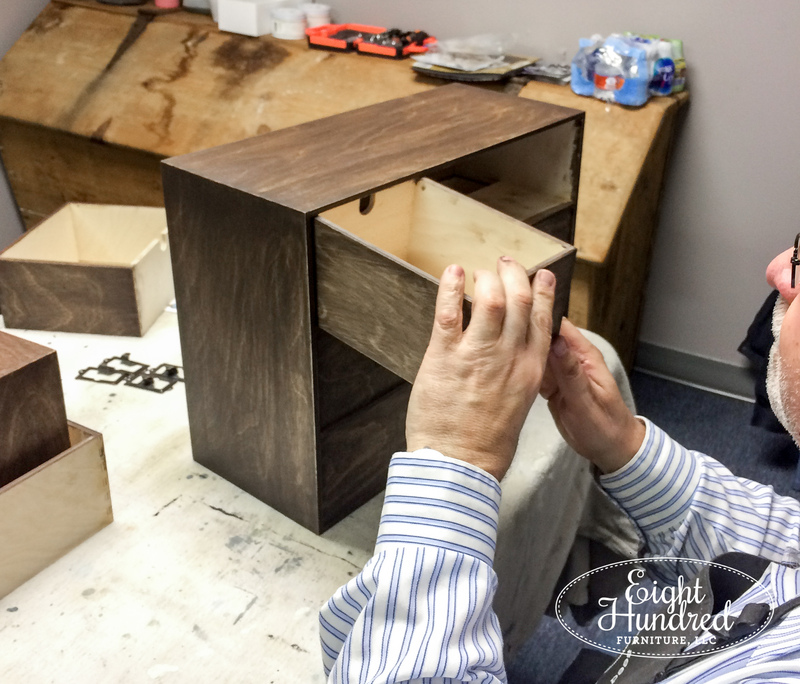 The storage boxes felt a little rough because the wood grain had raised up from the MMS Milk Paint. 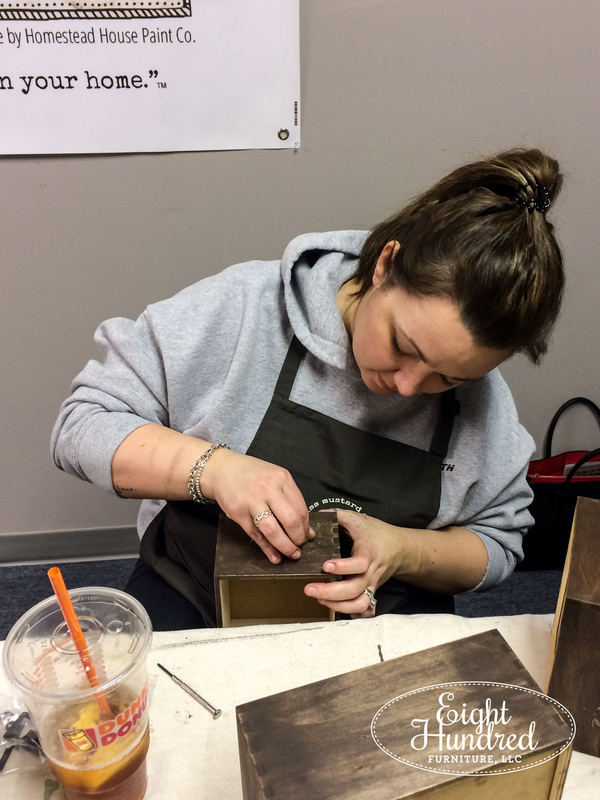 I taught the class how to wet sand using Hemp Oil and 400 grit sandpaper. 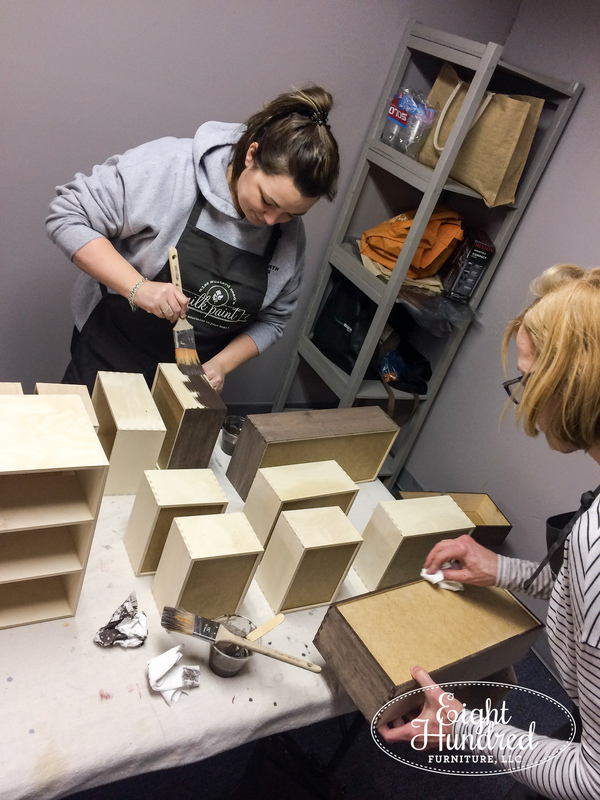 By following this technique, their boxes felt velvety smooth after wiping back the excess Hemp Oil! 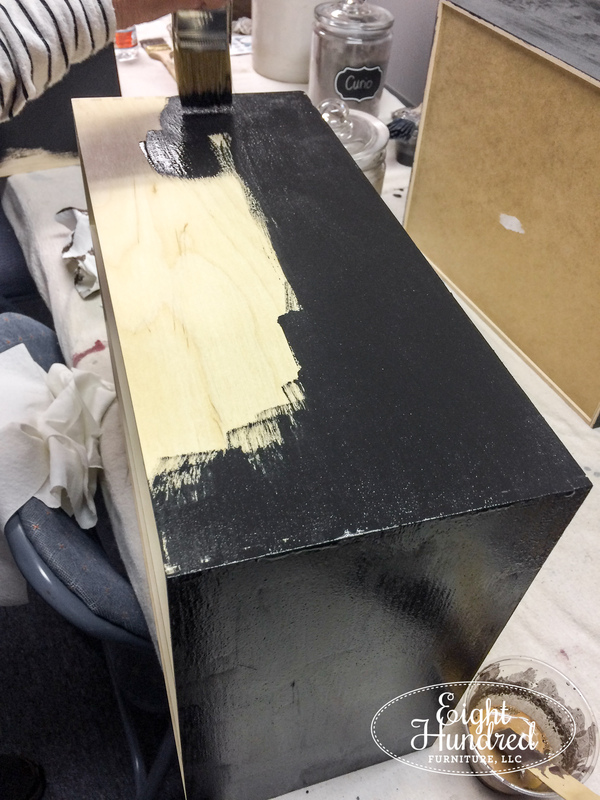 They added depth and character by applying some Antiquing Wax as well. 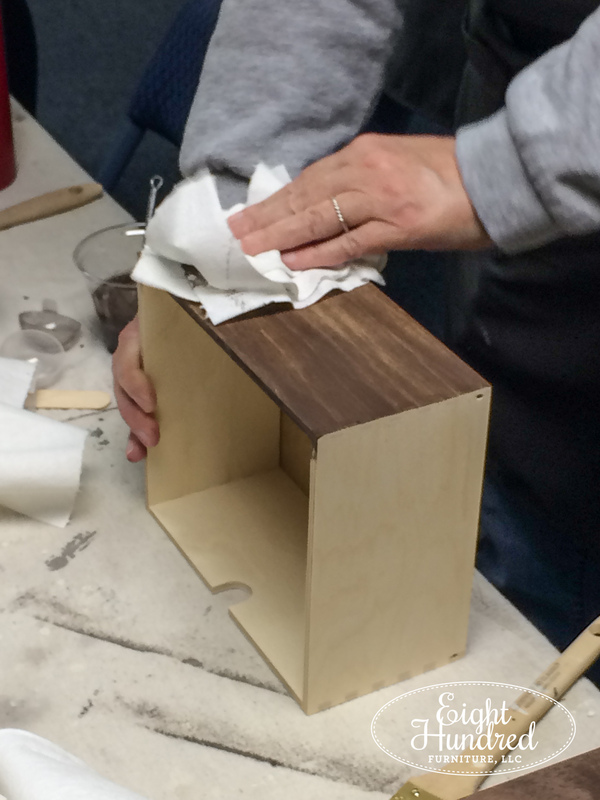 Once the boxes were all sealed and wiped clean, it was time to install the label holders. 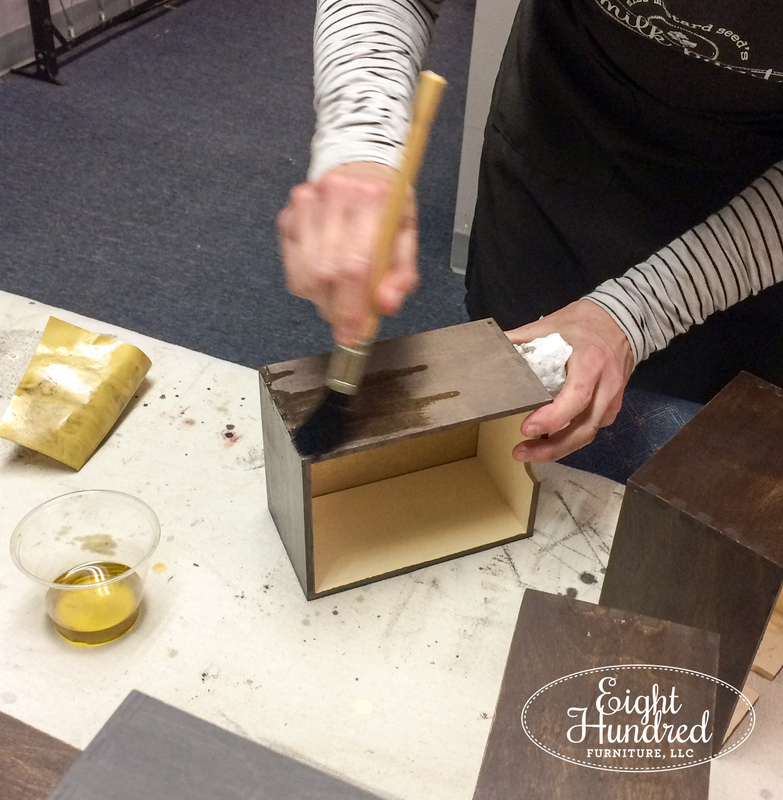 This was the step that took the boxes from ho-hum to card catalog fabulous! 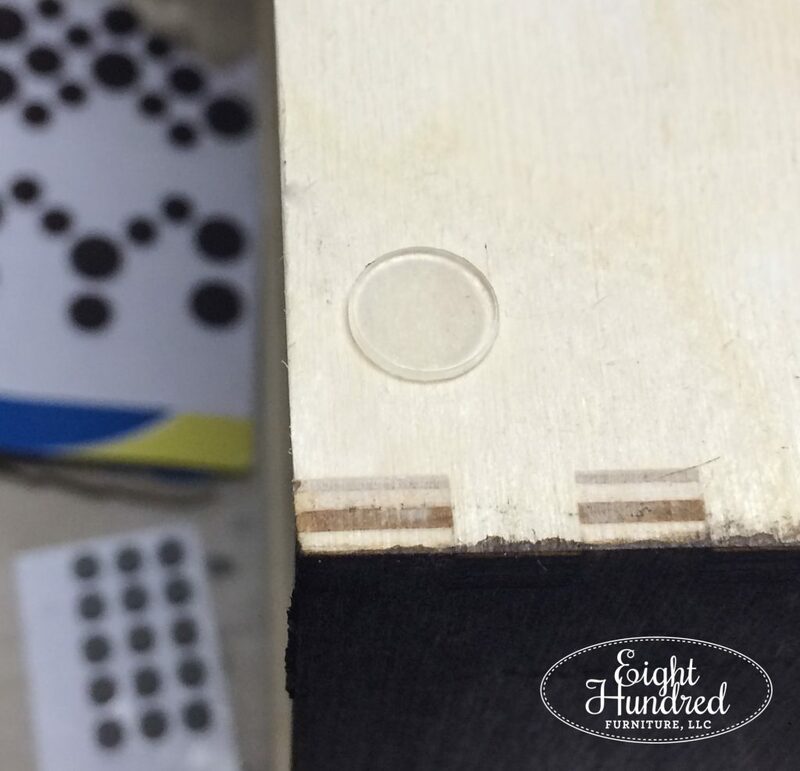 I had pre-measured where the center of each box was and pre-drilled holes to make installation easier and faster. 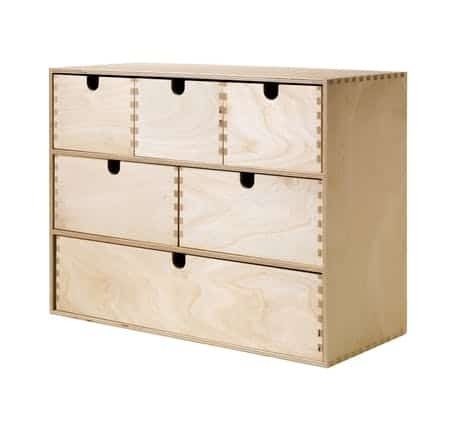 The screws that fit the project were teeny tiny, but we didn’t lose any and no one went cross-eyed! The boxes looked amazing with the label holders installed! 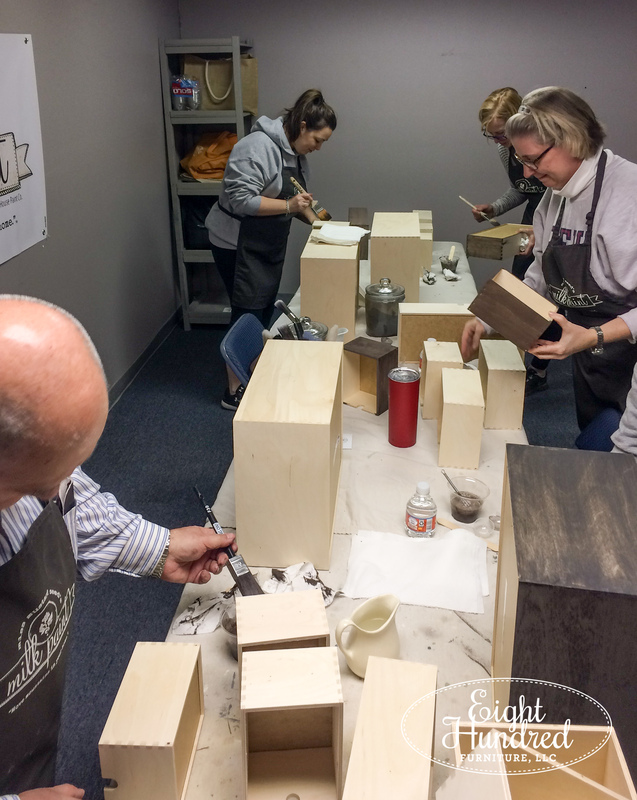 Soon, the workshop room was filled with the satisfying sound of wood scraping as everyone put their card catalogs back together. I brought felt, plastic and foam feet with me so the card catalogs won’t scratch the surface they’re placed on at home. Most people picked these plastic discs and the felt pads. I bought an assortment from my local dollar store and they are an inexpensive way to protect your furniture! 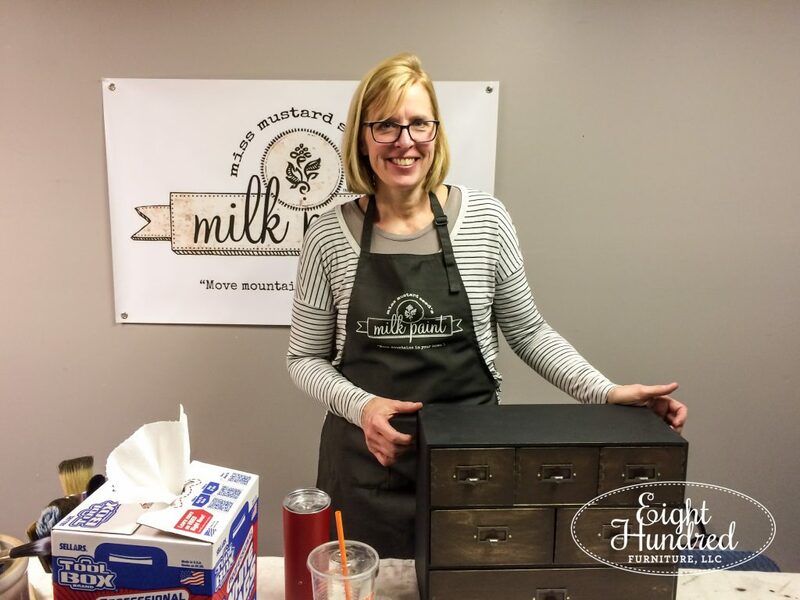 We had a total blast and I do plan on running another version of this at Morgantown Market in the future. It probably won’t be until the summer, but I know we’ll have just as good of a time as we had this past weekend! 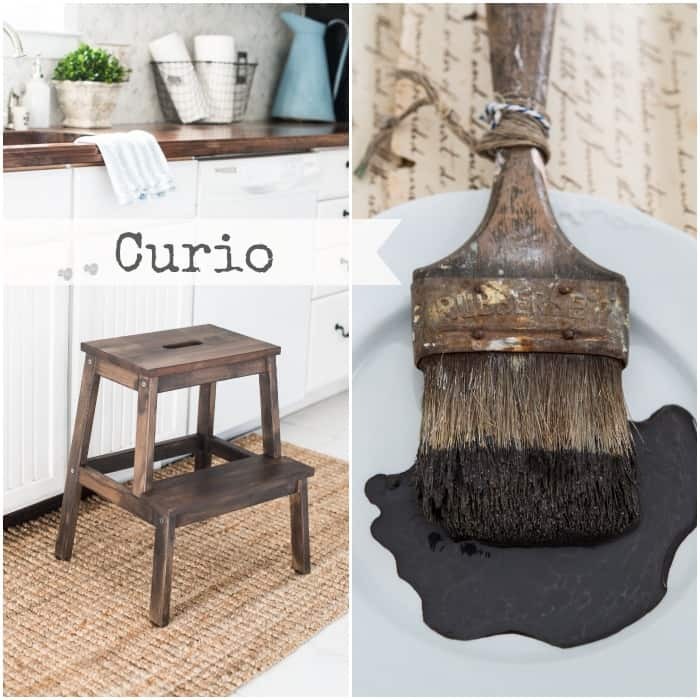 If you want to replicate this look at home, you can use Curio and Typewriter MMS Milk Paint, Hemp Oil and Antiquing Wax to transform a raw wood project of your choice! 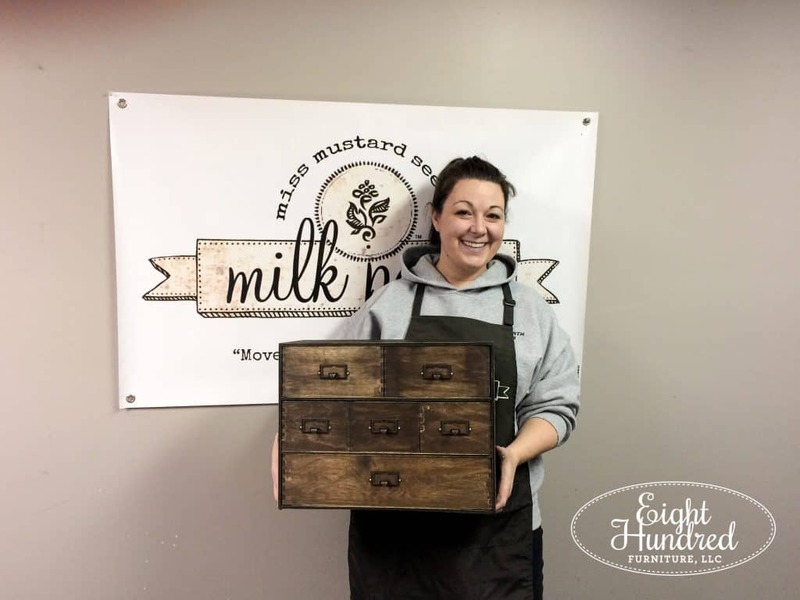 Shop for all Miss Mustard Seed’s Milk Paint products from my booth space at Morgantown Market and join me for any of upcoming events to join in on the fun! 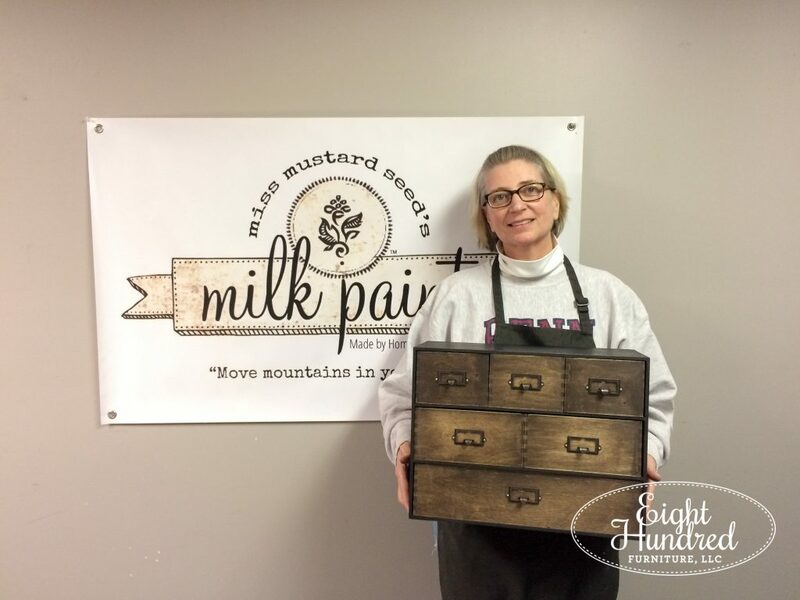 I’d love to help you fall in love with Miss Mustard Seed’s Milk Paint!